KHARI KILL AKA the THE VOICE OF D GHETTO as Brooklyn calls him, has definitely reestablish New York as a power house in conscious reggae music. Born in the Trinidadian ghetto of La Horquetta , In his early teens he discovered his gift of song writing. This was the foundation of khari’s arsenal of lyrics that would come to be delivered over various genres of music . 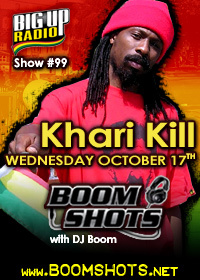 Khari can be described as one of the most versatile reggae artist in the game today, his songs rage against oppression, poverty and injustice. His debut single " PICTURE OF SELASSIE " on the " MASSIVE B " label, went straight to # 1 on reggae charts world wide . Since then every song released by KHARI KILL have all been HITS.